Dramatic new research may change the fate of the hundreds of people who wait for a kidney transplant every year. The study hinged on the ability to cure hepatitis C infections, a possibility that became a reality in 2014. More than 97,000 patients are awaiting kidney transplants, often for as many as five or more years. One of the biggest factors affecting transplant wait time is the availability of organs — there just aren't enough to go around. And part of that reason is that donated kidneys must meet strict criteria, including screening for infectious diseases. About 500 kidneys from donors infected with hepatitis C are tossed aside, every year. But what would happen if doctors transplanted those organs instead of rejecting them? Could the infection be cured after transplant? That's precisely what lead researcher David S. Goldberg from the University of Pennsylvania tried out. The results of the clinical trial were published in April in the New England Journal of Medicine. Hepatitis C is a virus that affects the liver. The virus must attach to and infect liver cells to reproduce. Once copied and released into the blood, the virus circulates throughout the body. It spreads through contact with infected blood, so sharing needles or receiving transfusions or organs from infected people can pass the infection on. There are several different genotypes of the virus, which differ in their sequence of genetic material. The primary type in the US is type 1 (about 75% of patients have it), type 2 and 3 take up about 20–25% of the population, and the rest are types 4, 5, or 6. Type 1 is not only the most widespread, but it's also the hardest to treat. Before 2014, hepatitis C infections usually resulted in liver disease, cirrhosis, liver failure, liver cancer, and eventually death. In 2014, there were an estimated 30,500 cases of acute hepatitis C infections in the US. That year marked a game-changer in the treatment of the disease. A clinical trial showed 94% of people who took a once-daily, single tablet combination of ledipasvir and sofosbuvir, two hepatitis C drugs, were virus-free after 12 weeks. On October 10, 2014, the combination drug, under the brand name Harvoni, was approved by the US Food and Drug Administration (FDA). The FDA approved another antiviral combination drug — of elbasvir and grazoprevir — called Zepatier in January 2016. 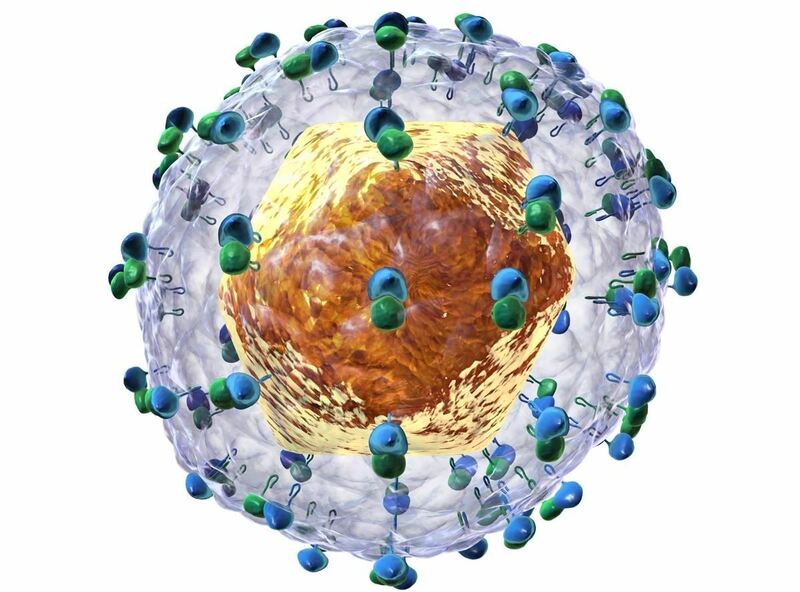 It showed excellent results in hepatitis-infected patients, curing 94–97% of patients infected with type 1 hepatitis and 97–100% of those infected with the easier-to-treat type 4. Combinations of other antiviral drugs have been tested in hepatitis C infections and showed promising results, but none could boast this amazing cure rate. The remarkable results with this antiviral combination set the stage for the research study by Goldberg and his team. Their wild idea? Transplant kidneys infected with hepatitis C into needy recipients, then cure the infection. The new study enrolled participants between the ages of 40 and 65 who had been waiting for a transplant for at least a year and a half. On average, the ten patients waited 58 days for a transplant after enrolling in the trial — some in as few as 11 days, while others waited for over 100 days. At three days after surgery, all ten tested positive for hepatitis C, then the researchers treated them for 12 weeks with Zepatier. Twelve weeks after the treatment was stopped, the researchers found no virus in any patients, and they were considered cured of their contracted hepatitis C. The team has received approval to add ten more patients to the study. "If future studies are successful, this may be a viable option for patients who may otherwise never see a transplant," Goldberg said in a a press release from the University of Pennsylvania School of Medicine. And 500 more kidneys alone could be available for transplant each year.